Garden City, NY: Doubleday & Company, 1948. Signed limited first edition of General Eisenhower’s wartime memoirs. Thick octavo, original cloth, cartographic endpapers, top edge gilt, original acetate. Signed by Dwight D. Eisenhower, number 299 of 1426 copies. Fine in the original acetate, which is in fine condition. Original slipcase in near fine condition with light rubbing. A very sharp example. 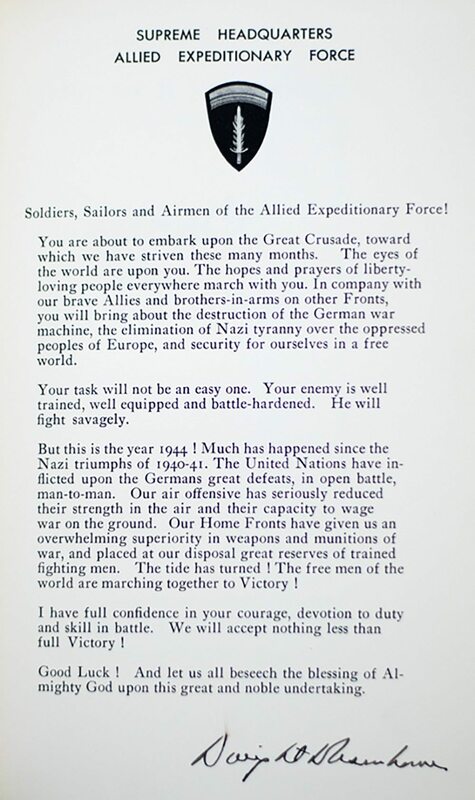 Five-star General Dwight D. Eisenhower was arguably the single most important military figure of World War II. For many historians, his memoirs of this eventful period of U.S. history have become the single most important record of the war. 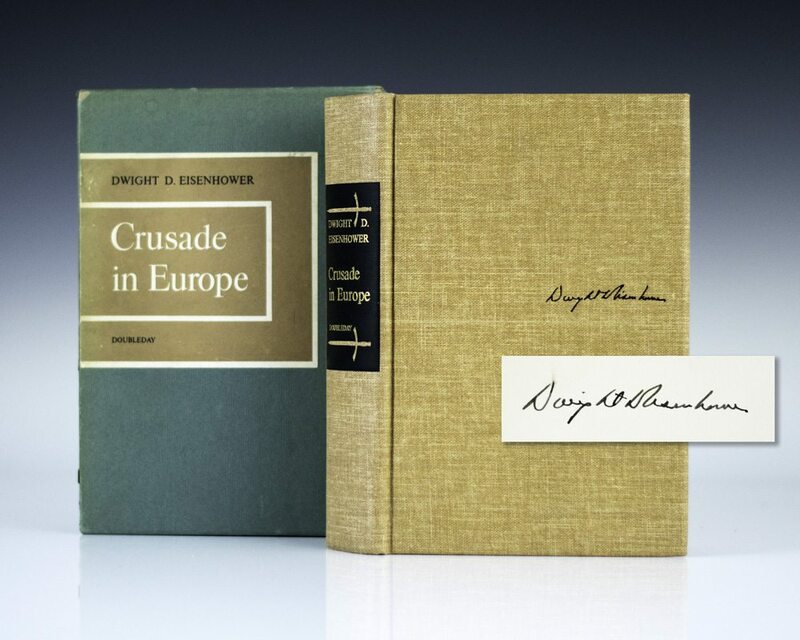 Crusade in Europe tells the complete story of the war as Eisenhower planned and lived it. Through his eyes, the enormous scope and drama of the war―strategy, battles, moments of fateful decision―become fully illuminated in all their fateful glory. "Eisenhower gives the reader true insight into the most difficult part of a commander's life" (New York Times). 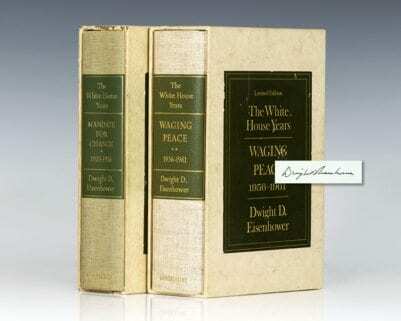 The White House Years: Mandate for Change 1953-1956 and The White House Years: Waging Peace 1956-1961. Garden City: Doubleday and Company, 1963-65. Signed limited first editions, each volume numbered; one of 1500 copies. Two volumes, thick octavo, original tan cloth, original slipcases. Both are fine condition with the original acetate dust jacket, which are in near fine to fine condition. The slipcases are in near fine condition. A nice set. First editions of each volume of President Eisenhower’s memoirs. Two volumes, octavo, original cloth, pictorial map endpapers. Inscribed in volume one on the half title page by the author, “For Bob Clark With the warm regard his friend Dwight D. Eisenhower.” The recipient, Robert E. Clark worked for The International News Service and interviewed Eisenhower on several occasions. Both are fine condition in very good to near fine dust jackets. A nice inscription. Fountain Pen used by Dwight D. Eisenhower. Rare fountain pen used by President Dwight D. Eisenhower in the signing of the Federal Employees Salary Increase Act of 1958. Mounted and framed with with an inscription, “Presented to Russel M. Stephens, President American Federation of Technical Engineers, AFL-CIO by President Dwight D. Eisenhower, June 20, 1958.” The entire piece measures 10.5 inches by 8.5 inches. Dwight D. Eisenhower Signed Photograph. Garden City, NY: Doubleday and Company, 1963-65. Signed limited first editions, each one of 1500 copies. Two volumes, thick octavo, pictorial endpapers, original tan cloth, original slipcases. Both are fine condition with the original acetate dust jacket, which are in near fine condition. The slipcases are in very good condition with some toning. 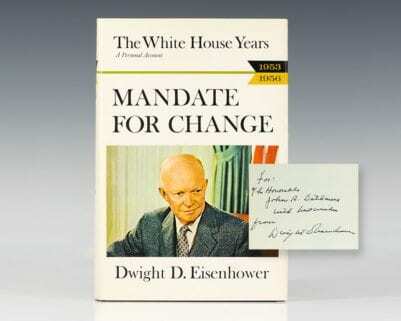 The White House Years: Mandate for Change 1953-1956. Garden City, NY: Doubleday and Company, 1963. First edition of volume one of President Eisenhower’s memoirs. Octavo, original cloth, pictorial map endpapers. Inscribed on the half title page by the author, “For The Honorable John R. Dethmers with best wishes from Dwight D. Eisenhower.” The recipient, John R. Dethmers was a member of the Michigan Republican State Central Committee in 1939. Dethmers served as Chairman of the Michigan Republican Party from 1942–1945 and was a delegate to the 1944 Republican National Convention. He served as Michigan Attorney General from 1945-1946. Governor Harry Kelly appointed Dethmers Justice of the Michigan Supreme Court, serving from 1946–1970 and serving as Chief Justice of the Michigan State Supreme Court in 1953, 1956–1962, and 1967-1969. Fine in a near fine dust jacket. A nice association. Eisenhower, Dwight D. and Mamie Doud Eisenhower; David Eisenhower. Photograph of the Eisenhower family, signed by Dwight D. and Mamie Eisenhower, their son and daughter-in-law and only grandchild. Inscribed by Dwight D. Eisenhower, “For Ken & Joyce Browne with best wishes Dwight D. Eisenhower,” and signed, “Mamie Doud Eisenhower.” Additionally inscribed by the Eisenhowers’ eldest son John and his wife Barbara, “To the Brownes from Barbara and John Eisenhower” and signed by their son David Eisenhower. In fine condition. Double matted and framed. The entire piece measures 16 inches by 14.25 inches. Rare and desirable signed by members of three generations of the Eisenhower family. Eisenhower, Dwight D. and Herbert Hoover. Herbert Hoover and Dwight D. Eisenhower Signed Photograph. Rare original photograph of Dwight D. Eisenhower, Herbert Hoover and Iowan Governor William Beardsley seated in an automobile which was part of the August 1954 Iowa State Fair Parade. Boldly signed by Dwight D. Eisenhower and Herbert Hoover, and inscribed by Beardsley, “For the Ken Brownes, Wm. S. Beardsley,”Accompanied by a typed letter signed by Herbert Hoover dated April 25, 1960 and addressed to Kenneth Browne, “Dear Mr. Browne: I do appreciate your sending me that Indian version of the 23rd Psalm. It was most gracious of you. Yours faithfully, “Herbert Hoover.” Both the photograph and letter are in near fine condition. 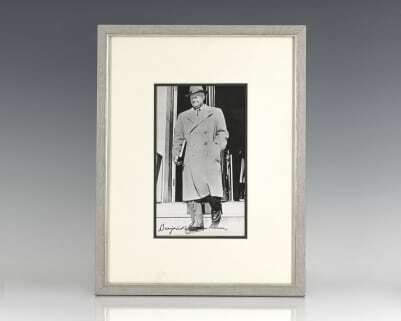 Rare and desirable signed by Eisenhower and Hoover. Signed limited first editions, each one of 1500 copies. Two volumes, thick octavo, pictorial endpapers, original tan cloth, original slipcases. Both are fine condition with the original acetate dust jacket, which are in fine condition. The slipcases are in fine condition. An exceptional set. Dwight D. Eisenhower Signed Republican National Convention. Program for the 1956 Republican National Convention in San Francisco, August 20, 1956, signed on the front and back by numerous attendees, including a signature of President Eisenhower. Other signers include: Iowa Governor Leo Hoegh; Wisconsin Governor Walter J. Kohler, Jr.; South Dakota Governor Joe Foss; California Senator Thomas Kuchel; New Jersey Senator Howard Alexander Smith; Delaware Senator John J. Williams; Ohio Senator George H. Bender; New Jersey Senator Clifford P. Case; and numerous others. In very good with light toning. 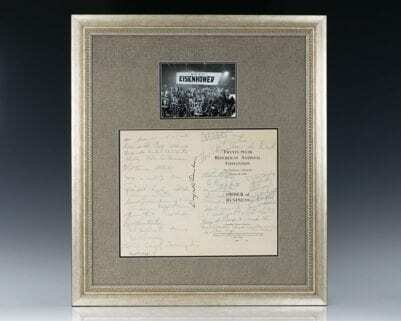 A unique piece signed by President Eisenhower and many of those responsible for helping his reelection campaign. Double matted and framed with a photograph of the 1956 Republican Convention. The entire piece measures 22 inches by 25.5 inches. A unique piece. Photograph of Dwight D. Eisenhower in military uniform, boldly signed by him. In fine condition. Double matted and framed. The entire piece measures 17.75 inches by 14.75 inches. A very attractive signed photograph. Photograph portrait of General Dwight D. Eisenhower inscribed, “For Henry Sage Dunning, A veteran of World World I and a distinguished member of Columbia’s family, with admiration and affectionate regard, Dwight D. Eisenhower.” In near fine condition. Matted and framed. The entire piece measures 13 inches by 19 inches.